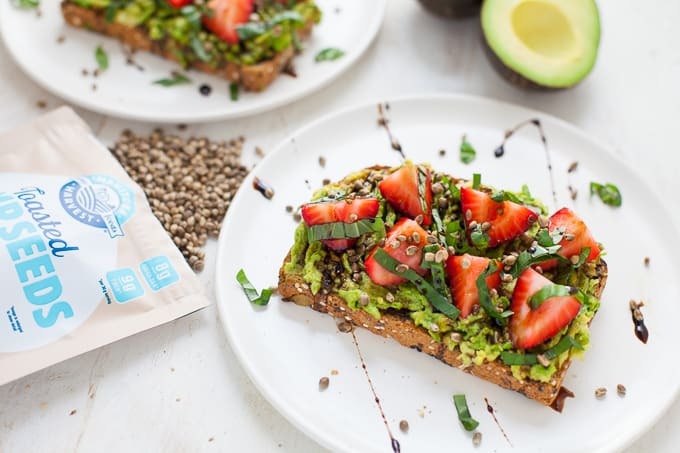 With its sweet and savory components, this strawberry basil avocado toast made with Toasted Hemp Seeds is perfect for breakfast, lunch or a snack! This post is sponsored by Manitoba Harvest Hemp Foods. Thanks so much for supporting the brands that make TFD possible. As always, opinions are my own! Happy Tuesday, my friends! Hope you all had a great first official weekend of summer. I had a relaxing but productive weekend consisting of massage, movement, quality friend time, reading, relaxing in the park, laundry, cleaning and meal prep. It was a nice balance of self-care/me time and GSD. Speaking of meal prep, funny story. We signed up for a CSA this year (if you’re not sure what a CSA is or if it’s for you, check out my article on SHAPE). 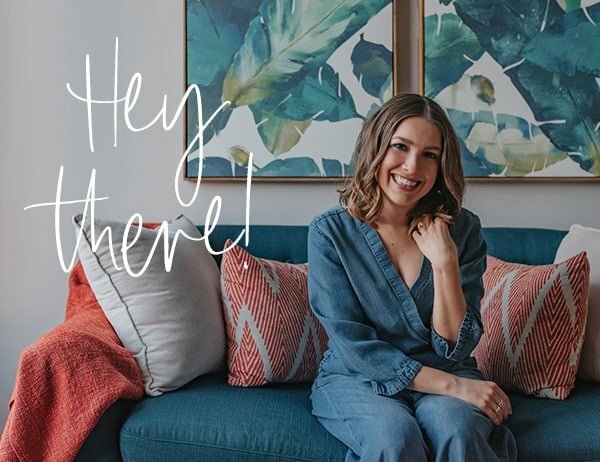 And Saturday I’m hanging out at the house and realized my neighborhood farmer’s market is today – I should go check it out! And then it dawned on me, hey, wait a second, we haven’t heard anything about when our CSA starts and it should be starting any week now. So I go to the farmer’s market, stock up my tote bag with produce and am cashing out when it dawns on me that this farm is the farm we are getting our CSA from! So I asked when does your CSA start? She said it did start. It started last week. She said do you want a box of produce from last week? Sure. So now I have a box of produce plus my tote bag full that I already paid for and then she was like we’ll see you Tuesday for your next pick up! AKA in THREE DAYS! LOL. I mean there are much worse problems in the world than having too much produce in your fridge but I just had to laugh at the fact that I’ll be eating salads and strawberries 24-7 for the next week. So it’s no surprise that today’s recipe contains strawberries! Strawbs are in-season right now (until the end of June) so you can pick up a pint or quart at your local farmer’s market or try strawberry picking at a nearby farm! Lately, I’ve been throwing sliced strawbs on top of salads, oatmeal, toast and just eating them plain jane. My parents are coming to visit us tomorrow from Buffalo and I think I just might have to make my balsamic roasted strawberry shortcake for them to use up the rest of the strawb bounty. Have you ever tried strawberries on toast? It’s pretty delicious. Especially on avocado toast. 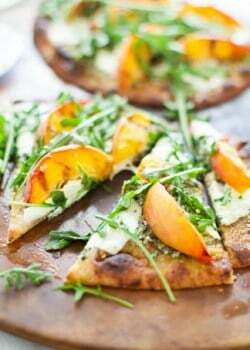 Because it’s sweet meets savory. On this avo toast, I used strawberries, basil, balsamic reduction and Toasted Hemp Seeds for a little extra salty flavor and satisfying crunch. Have you ever tried Toasted Hemp Seeds? They’re totally different in texture and taste than regular hemp seeds. More crunch. More nutty, salty flavor. And Manitoba Harvest just launched their own Toasted Hemp Seeds in both Sea Salt and Sriracha flavors. 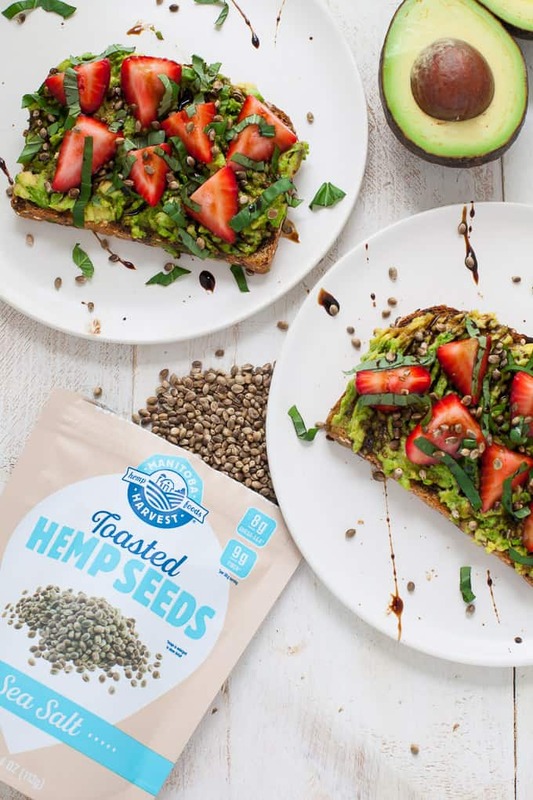 Made in small batches, whole hemp seeds are lightly toasted and seasoned with quality ingredients, creating delicious snacks that you can eat at home or on the go. 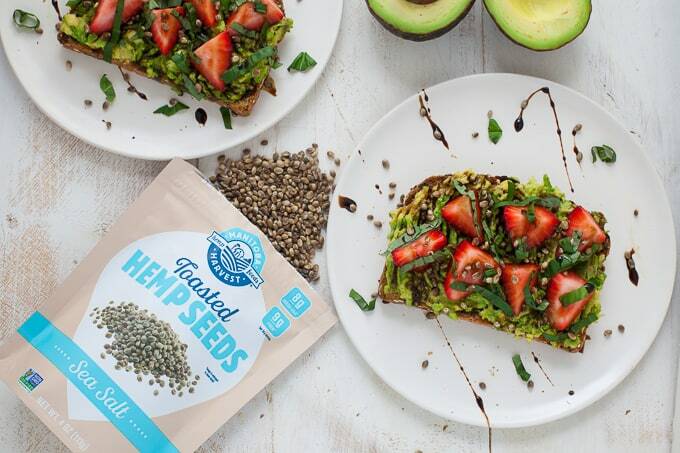 Toasted Hemp Seeds pack a powerful nutrition punch too – each 3 tbsp (30g) serving of Toasted Hemp Seeds contains 8g of protein, 8g of omegas 3&6 and 9g of fiber! 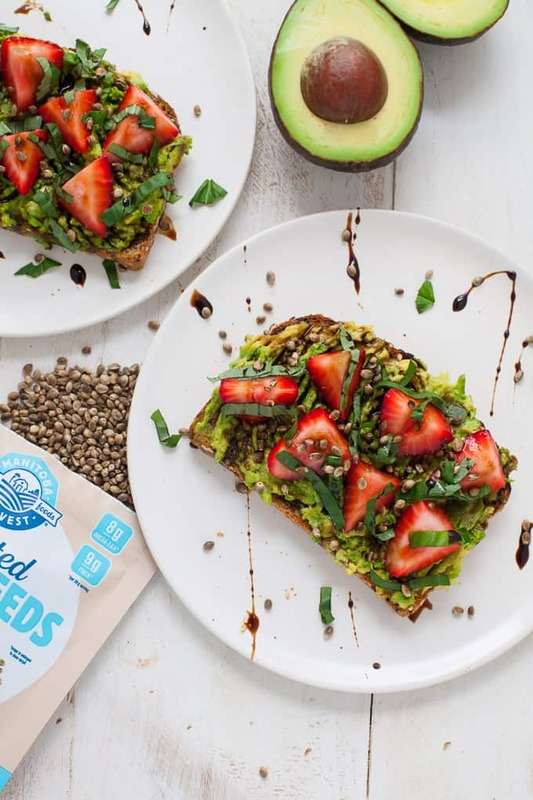 Toasted Hemp Seeds make a delicious on-the-go snack on their own or a fun topping for salads, toasts, and more. 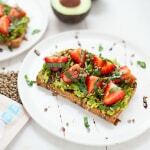 With its sweet and savory components, this strawberry basil avocado toast is perfect for breakfast, lunch or a snack. 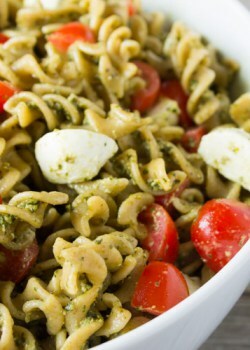 Super easy to make this time of year too as strawberries and basil are in full force! Are you ready to try Toasted Hemp Seeds! 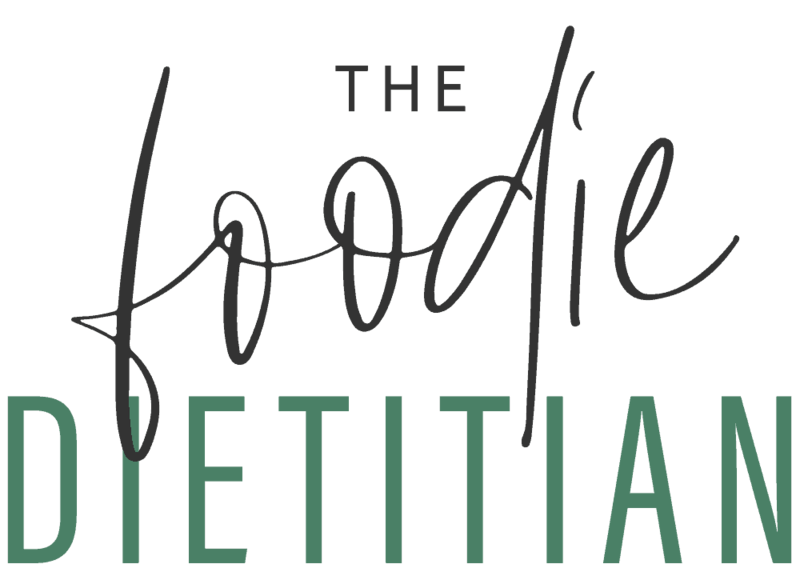 Good news – Manitoba Harvest was awesome enough to offer 15% off their entire website for TFD readers through July 31, 2017. All you have to do is enter the promo code KaraLydon at checkout! Toast bread in the toaster or oven. Top with avocado and use a fork to smash it onto toast. Top with strawberries, basil and Toasted Hemp Seeds. Drizzle balsamic reduction over toast. Season with salt and pepper to taste. To make balsamic reduction: bring balsamic vinegar to boil in non-stick pan. Reduce heat to simmer and let simmer until vinegar reduces by half and becomes thick enough to coat the back of a spoon. Let cool to thicken even more. Tell me, have you ever tried Toasted Hemp Seeds? What’s your fav avocado toast? 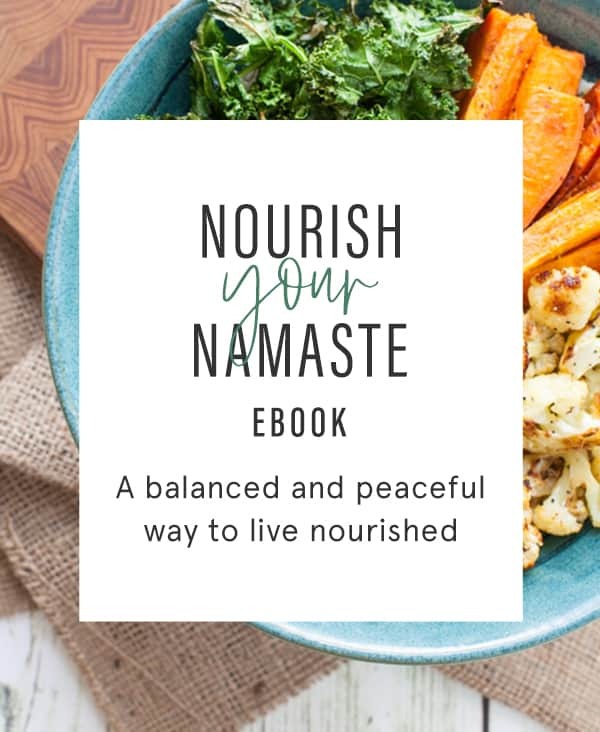 For more hemp seed inspo, check out my recipes below! I could definitely enjoy this as a meal or a snack! Love the color and texture! Yum! I wouldn’t have thought to add hemp seeds. Also, I’m OBSESSED with all things balsamic reduction or aged balsamic!! Thanks Stacey! Balsamic anything is my jam right now! Hello, avocado toast upgrade!! Love the tasty additions to your traditional avo toast! Thanks Bethany! This is one of my faves this time of year! Love these crunchy toppers! Strawberries and basil sound delicious together! Thanks Kelly! This combo is to DIE for! Thanks Christina! 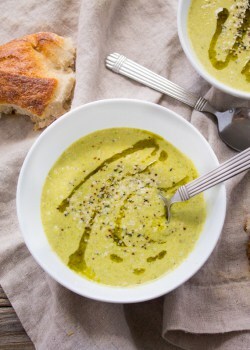 It’s the perfect summer recipe!